This versatile seasoning and base delivers balanced tomato and chicken flavor. A great foundation for paella, zarzuelas, sopas and estofados. SALT, MONOSODIUM GLUTAMATE, CORN STARCH, SUGAR, BEEF FAT, HYDROLYZED CORN PROTEIN, NATURAL FLAVORS, CHICKEN FAT, TOMATO POWDER, MALTODEXTRIN, AUTOLYZED YEAST EXTRACT, CITRIC ACID, DEHYDRATED CHICKEN MEAT, SILICON DIOXIDE (PREVENTS CAKING), TURMERIC, YELLOW 6 LAKE, DEHYDRATED PARSLEY, CARAMEL COLOR, DISODIUM INOSINATE, DISODIUM GUANYLATE, ANNATTO (COLOR), YELLOW 6, RED 40. SAL, GLUTAMATO MONOSÓDICO, ALMIDÓN DE MAÍZ, AZÚCAR, GRASA VACUNA, PROTEÍNA DE MAÍZ HIDROLIZADA, SABORIZANTES NATURALES, GRASA DE POLLO, TOMATE EN POLVO, MALTODEXTRINA, EXTRACTO DE LAVADURA AUTOLIZADO, ÁCIDO CÍTRICO, CARNE DE POLLO DESHIDRATADA, DIÓXIDO DE SILICIO (EVITA AGLUTINAMIENTO), TURMERICO, AMARILLO 6 LAKE, PEREJIL DESHIDRATADO, COLOR CARAMELO, INOSINATO DISÓDICO, ANNATTO (COLOR), AMARILLO 6, ROJO 40. 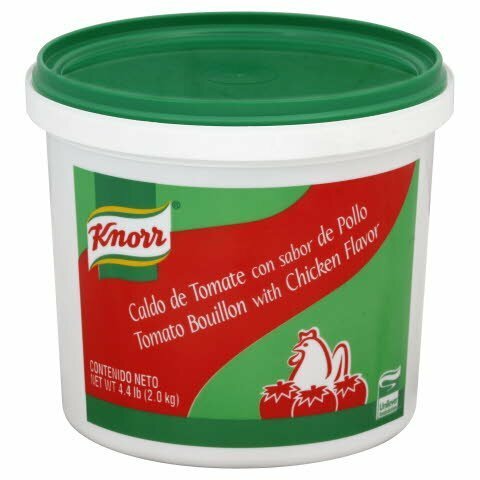 To make a delicious tomato broth, dissolve 2 teaspoons Knorr® Tomato Bouillon with Chicken flavor in 2 cups boiling water. Use as desired to enhance the flavor of your favorite soup, stew, sauce, rice, vegetable, mole and pasta recipes. The perfect start for traditional Latino dishes - enchiladas, fajitas, sopas - or as an unexpected flavor booster for soups, sauces and sides. Shelf stable convenience. Dependable consistency. Resealable container for multi-occasion usage. Easy to dispense and measure. Use for cooking rice, seasoning veegetable and a base for soups.